Pizza, wine and espresso are the quintessential bywords for the Italian lifestyle. Indulge in a bit of "la dolce vita"by making the perfect espresso with the bonVIVO Intenca espresso maker. Mama can make it and so can you! Just fill the lower part of the three part moka pot with water, put the ground espresso beans into the basket sieve, put the top on, place it on the cooker to boil and, hey presto, your strong full bodied espresso is ready within minutes! The espresso maker is the perfect synthesis of form, functionality and quality. 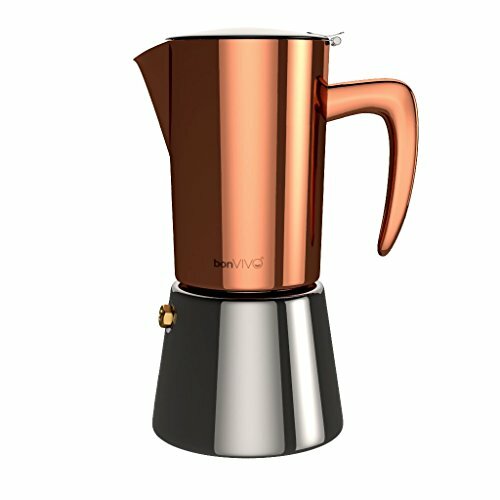 A masterpiece of timeless design, this moka pot with its elegant copper chrome finish is a must have for every kitchen. Why not try different kinds of ground espresso beans and vary the amount of grinds? Variety is the spice of life! If you have any questions about this product by bonVIVO, contact us by completing and submitting the form below. If you are looking for a specif part number, please include it with your message.